Based on the original article by Joshua Pomeroy. Courtesy of NIST. Using a relatively straightforward technique, a team of NIST researchers including Department of Materials Science and Engineering (MSE) graduate student Kevin Dwyer has created what may be the most highly enriched silicon currently being produced. The material is more than 99.9999% pure silicon-28 (28Si), with less than 1 part per million (ppm) of the problematic isotope silicon-29 (29Si). Many quantum computing schemes require isotopically pure silicon to act as a substrate in which qubits–the quantum bits that store information–are embedded. In reaching “five nines” (99.9998%) last year and better than “six nines” this year*, the NIST team has surpassed its own enrichment goals. “I think if you ask most people in the community if six nines was sufficient for quantum computing purposes, they would say, ‘Yeah! 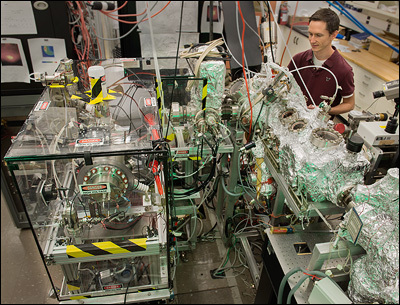 By a factor of a hundred!’” says Josh Pomeroy, team leader of the Quantum Processes and Metrology Group at NIST’s Physical Measurement Laboratory (PML). “The real challenge now is to make this amorphous enriched silicon into a form that is equivalent to what you would get if you bought a wafer or epitaxial layer, which will eventually be needed to build practical quantum information systems.” Pomeroy's team has already had some success in tackling this next step, which involves growing the ultra-enriched silicon as a nearly perfect crystal. Currently, there is no reliable commercial source for sufficiently enriched silicon, which should consist of at least 99.99% 28Si to be useful for most quantum computing purposes. Unenriched silicon naturally contains about 92% 28Si, but there are other isotopes in there too, including 29Si at about 4.7%. The presence of 29Si is a problem in quantum computing because it dominates the breakdown of quantum information, or “decoherence,”** of the qubits. It's been demonstrated over the past decade or so that the elimination of unpaired spins can improve the fidelity of quantum information. Every factor of ten reduction of 29Si results in a factor of ten improvement in coherence time. The success of quantum information schemes that rely on silicon therefore strongly depends on finding a reliable way to realize this material. To isolate the 28Si, the researchers employ a technique similar to mass spectrometry. Silicon atoms from natural abundance silane gas (SiH4) are ionized, extracted at high voltage, and then shot through a magnetic field, which causes the ions' trajectories to curve. The radius of their curvature depends on their mass, so 28Si and 29Si diverge into separate beams. To collect the 28Si ions, researchers direct the beam of the preferred ions onto an unenriched silicon substrate about 1 square cm. University of Maryland graduate student Kevin Dwyer (MSE), advised by Joshua Pomeroy (NIST) and Associate Profesor John Cumings (MSE), with the silicon enrichment apparatus. The process begins at the left, where natural-abundance silicon in the form of silane gas (SiH4) is ionized. The ions pass through a magnetic field (top left), which causes their paths to curve to different degrees based on their mass. The silicon-28 ions, now separated from the other silicon isotopes, are decelerated through an ultra-high vacuum chamber (top center) and into the deposition chamber (top right). Photo Courtesy of Jenny Lee, NIST. Two years ago, Pomeroy and Dwyer used a version of this setup to reach "three nines," creating silicon that was 99.9% 28Si. To achieve the new record, the team made improvements to their system such as decreasing the vacuum pressure, which reduced incorporation of 29Si from the silane gas, and increasing the distance the particles travel after passing through the magnetic field from about 10 cm to about 1 meter. Another recent improvement is that they have moved on from producing amorphous silicon, a form that is unusable for quantum information. Amorphous silicon is filled with dangling bonds, oxygen molecules, and other impurities that result in poor electrical properties that are important for both classical and quantum information. Instead, researchers need enriched silicon with a regular, crystalline structure. Pomeroy believes they have already created a couple of examples: high-resolution transmission electron microscopy (TEM) images of the silicon crystal structures they've made show the films have the same ordering as the single crystal substrates on which they are grown. To create the crystalline samples, the researchers grew the 28Si on a substrate heated to as high as 1250ͦ Celsius. At these high temperatures, they found that the enriched films mimic the structure of the unenriched crystalline silicon substrate almost perfectly. If the sample is too cold, there's not enough thermal energy for the atoms to order themselves properly. The team had expected that this step of raising the temperature might decrease the enrichment of the wafer. Instead, they found an unexpected benefit: for a sample heated to 600ͦ Celsius, the enrichment increased ten times, giving them their sixth nine, probably due to improvements in the vacuum pressure. “We were expecting to move backwards, to lose enrichment due to some thermal processes that were going to kick in, and it was rather surprising to us that we actually improved,” Pomeroy says. Applications for this super-high enrichment include all strategies for silicon-based qubits, because coherence problem is universal to all of quantum information. The team has plans to do multi-component enrichment of Silicon-germanium (SiGe), another popular compund that has the same problem. * An earlier result, which describes 99.9998% enrichment with amorphous silicon, was published recently in the Journal of Physics D (J. Phys. D: Appl. Phys.47345105; http://iopscience.iop.org/0022-3727/47/34/345105/article). The more recent measurements – 99.99996% enrichment and efforts to produce highly enriched crystalline silicon – are part of an ongoing project. ** Conventional binary digits (bits) can have one of two values: 0 or 1. Quantum bits (qubits), by contrast, can contain a superposition of different values at once as long as they are kept in a fragile condition called coherence. Breakdown of that state is called decoherence.